Do you have enough faith in you religious convictions and your belief in the First Amendment to refuse to submit to the murderous Muslim religious zealots who not only believe, but actually preach, that it is okay to murder innocent people simply because you perceive yourself to be offended by something? I'd like to think I do. My friend Peter Ingemi, also known as DaTechGuy, proved he does. After a fatwa was issued by one of those murderous Muslim religious zealots calling on the Muslim youth in America and Europe to kill the director, the producer and the actors and everyone who helped and promoted the so-called film, "Innocence of Muslims," Peter posted this video titled, "I will not submit to Islam." "My response to the declaration of FATWA on anyone who makes a film insulting Islam, come and get me you murderous bastards, I won't give up my 1st Amendment rights I'm a American." Before you say you are that courageous think about the ordeal the murderous Muslim religious zealots have put some folks through when they have been unable to actually have them murdered. Think about Salman Rushdie, who has been living in hiding and under police protection since 1989. Iran's Ayatollah Ruhollah Khomeini issued a fatwa calling for Rushdie's death following the publication of Rushdie’s 1988 prize winning book, The Satanic Verses. "STEVE INSKEEP: What do you think when you hear about violence in the Muslim world, because people perceive that their religion has been insulted? SALMAN RUSHDIE: Yeah. Well, what I would say, in a general sense, is that I feel that something has gone wrong inside the Muslim world, because I can remember - within my living memory - when some of these now-beleaguered, embattled cities like Beirut, Tehran, Damascus, Baghdad, when these were cosmopolitan, outward-looking, cultured cities which were interested in the rest of the world and were much more like open societies. And the fact that, in the last half-century, these cultures seem to have slid backwards into medievalism and repression is one of the - I think it's one of the great self-inflicted wounds. And out of that comes the rise of this new, much harsher Islam, come all these phenomena that you're talking about: the thin-skinnedness, the paranoia, the ease with which violence is engaged in, the readiness to believe that it's OK to kill people if you declare yourself offended by something. This is the mindset of the fanatic, the mindset of the tyrant. And it's a real shame that it seems to have spread so widely across the Muslim world. INSKEEP: You're saying that it says more about the perpetrators of violence than it does about whatever was written that offended them. RUSHDIE: Yes, of course. Of course it does. I mean, I think if we wish to live in any kind of a moral universe, we must hold the perpetrators of violence responsible for the violence they perpetrate. It's very simple. The criminal is responsible for the crime. I mean, it's quite clear that this YouTube film is a disgraceful, shoddy little thing. And it's, I think, perfectly proper to condemn it and the people who made it. But to murder people who had nothing to do with it because you deem yourself insulted and therefore other people's blood can randomly be spilled, that's clearly a deeply uncivilized attitude [Emphasis added]." I can't say it any better than that. Text of President Obama's speech to the Muslim world, delivered on June 4, 2009, courtesy of the White House. Credit where credit is due. Obama, as I suggested he do a year ago, finally confronted his, and our Muslim issue. The first 15 minutes of President Obama's speech to the Muslim world was what I wanted to hear from candidate Obama a year ago. Had he given that portion of his speech during the presidential campaign much of the irrational fear of Obama as some sort of Muslim Manchurian candidate would have been relieved. I found it Ironic that when Obama turned to democracy, religious freedom and women's rights, the speech was reminiscent of the remarkable series of speeches President Bush gave about the advance of freedom. This was one of President Obama's more important speeches and he rose to the occasion and gave a fine speech. There are numerous things about Obama's speech to the Muslim world I could criticize, but I will save that for another article. If you missed Obama's speech you should invest the 30 minutes required to read, listen to, or watch the entire speech. Reading summaries, excerpts and critiques lets others do the thinking for you. Snippets can't help you grasp the import, which you should have especially if you want to disagree in a knowledgeable manner. The text of President Obama's speech to the Muslim world, as prepared for delivery is available here. Ben Rhodes, President Obama’s foreign policy speechwriter, says Obama will address issues "that matter to people's lives" such as economic development, education, health, science and technology, and express the need for democracy, human rights when he addresses the Muslim world Thursday. And my job is to communicate to the American people that the Muslim world is filled with extraordinary people who simply want to live their lives and see their children live better lives. My job to the Muslim world is to communicate that the Americans are not your enemy. I also want to be clear that America's relationship with the Muslim community, the Muslim world, cannot, and will not, just be based upon opposition to terrorism. We seek broader engagement based on mutual interest and mutual respect. We will listen carefully, we will bridge misunderstandings, and we will seek common ground. We will be respectful, even when we do not agree. We will convey our deep appreciation for the Islamic faith, which has done so much over the centuries to shape the world -- including in my own country. The United States has been enriched by Muslim Americans. Many other Americans have Muslims in their families or have lived in a Muslim-majority country -- I know, because I am one of them. Above all, above all we will demonstrate through actions our commitment to a better future. I want to help more children get the education that they need to succeed. We want to promote health care in places where people are vulnerable. We want to expand the trade and investment that can bring prosperity for all people. In the months ahead, I will present specific programs to advance these goals. Our focus will be on what we can do, in partnership with people across the Muslim world, to advance our common hopes and our common dreams. And when people look back on this time, let it be said of America that we extended the hand of friendship to all people. There's an old Turkish proverb: "You cannot put out fire with flames." America knows this. Turkey knows this. There's some who must be met by force, they will not compromise. But force alone cannot solve our problems, and it is no alternative to extremism. The future must belong to those who create, not those who destroy. That is the future we must work for, and we must work for it together. And of course Obama will continue his never-ending string of apologies. 1: Now after the sabbath, toward the dawn of the first day of the week, Mary Magdalene and the other Mary went to see the sepulchre. 2: And behold, there was a great earthquake; for an angel of the Lord descended from heaven and came and rolled back the stone, and sat upon it. 3: His appearance was like lightning, and his raiment white as snow. 4: And for fear of him the guards trembled and became like dead men. 5: But the angel said to the women, "Do not be afraid; for I know that you seek Jesus who was crucified. 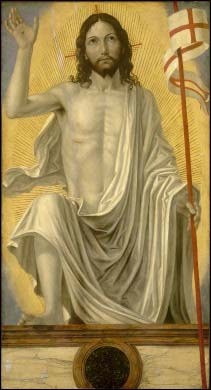 6: He is not here; for he has risen, as he said. Come, see the place where he lay. 7: Then go quickly and tell his disciples that he has risen from the dead, and behold, he is going before you to Galilee; there you will see him. Lo, I have told you." 8: So they departed quickly from the tomb with fear and great joy, and ran to tell his disciples. 1: And when the Sabbath was past, Mary Magdalene, and Mary the mother of James, and Salome, bought spices, so that they might go and anoint him. 2: And very early on the first day of the week they went to the tomb when the sun had risen. 3: And they were saying to one another, "Who will roll away the stone for us from the door of the tomb?" 4: And looking up, they saw that the stone was rolled back; -- it was very large. 5: And entering the tomb, they saw a young man sitting on the right side, dressed in a white robe; and they were amazed. 6: And he said to them, "Do not be amazed; you seek Jesus of Nazareth, who was crucified. He has risen, he is not here; see the place where they laid him. 7: But go, tell his disciples and Peter that he is going before you to Galilee; there you will see him, as he told you." 1: But on the first day of the week, at early dawn, they went to the tomb, taking the spices which they had prepared. 2: And they found the stone rolled away from the tomb, 3: but when they went in they did not find the body. 4: While they were perplexed about this, behold, two men stood by them in dazzling apparel; 5: and as they were frightened and bowed their faces to the ground, the men said to them, "Why do you seek the living among the dead? 6: Remember how he told you, while he was still in Galilee, 7: that the Son of man must be delivered into the hands of sinful men, and be crucified, and on the third day rise." 8: And they remembered his words, 9: and returning from the tomb they told all this to the eleven and to all the rest. 1: Now on the first day of the week Mary Magdalene came to the tomb early, while it was still dark, and saw that the stone had been taken away from the tomb. 2: So she ran, and went to Simon Peter and the other disciple, the one whom Jesus loved, and said to them, "They have taken the Lord out of the tomb, and we do not know where they have laid him." 3: Peter then came out with the other disciple, and they went toward the tomb. 4: They both ran, but the other disciple outran Peter and reached the tomb first; 5: and stooping to look in, he saw the linen cloths lying there, but he did not go in. 6: Then Simon Peter came, following him, and went into the tomb; he saw the linen cloths lying, 7: and the napkin, which had been on his head, not lying with the linen cloths but rolled up in a place by itself. 8: Then the other disciple, who reached the tomb first, also went in, and he saw and believed; 9: for as yet they did not know the scripture, that he must rise from the dead. 10: Then the disciples went back to their homes. 11: But Mary stood weeping outside the tomb, and as she wept she stooped to look into the tomb; 12: and she saw two angels in white, sitting where the body of Jesus had lain, one at the head and one at the feet. 13: They said to her, "Woman, why are you weeping?" She said to them, "Because they have taken away my Lord, and I do not know where they have laid him." 14: Saying this, she turned round and saw Jesus standing, but she did not know that it was Jesus. 15: Jesus said to her, "Woman, why are you weeping? Whom do you seek?" Supposing him to be the gardener, she said to him, "Sir, if you have carried him away, tell me where you have laid him, and I will take him away." 16: Jesus said to her, "Mary." She turned and said to him in Hebrew, "Rab-bo'ni!" (which means Teacher). 17: Jesus said to her, "Do not hold me, for I have not yet ascended to the Father; but go to my brethren and say to them, I am ascending to my Father and your Father, to my God and your God." 18: Mary Mag'dalene went and said to the disciples, "I have seen the Lord"; and she told them that he had said these things to her. Originally posted March 23, 2008. In a lawsuit filed Tuesday in Washington, the plaintiffs demand that the words "so help me God" not be added to the end of the president's oath of office. In addition, the lawsuit objects to plans for ministers to deliver an invocation and a benediction in which they may discuss God and religion. How many times do we have to say it? The Constitution guarantees freedom of religion, not freedom from religion. Michael Newdow filed similar unsuccessful suits over inauguration ceremonies in 2001 and 2005. This one will also be unsuccessful. John McCain has not talked about my Muslim faith. I'm sure before long we will hear that this clip is taken out of context, that Obama misspoke, and Obama will explain what he really meant to say. In the meantime it sure sounds like an admission that he is or was Muslim. 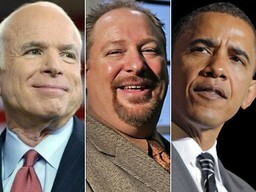 Obama also suggested that the McCain was behind persistent rumors that Obama is a Muslim rather than a Christian. "These guys love to throw rocks and hide their hand," Obama said, referring to the Republicans. Reminded that McCain and his top aides have denied pushing the Muslim rumor, Obama said the rumor is "being promulgated on Fox News ... and Republican commentators who are closely allied to these folks." He later added, "What I think is fair to say is that coming out of the Republican camp there have been efforts to suggest that perhaps I'm not who I say I am when it comes to my faith." I have not heard any commentator, Republican or otherwise, promulgating rumors that Obama is Muslim. To the contrary commentators are always careful to point out that he is in fact Christian. As I said in "Obama Should Confront His Muslim Problem Head On," I was raised to respect others and was taught that I should strive, like God, to be "no respecter of persons." I've always tried to do that. It does not matter to me what a person's religious beliefs are. What is important to me is that our leaders have some religious belief. I still say Obama should address his Muslim problem head on. Tonight the Reverend Rick Warren, author of the best-selling book "The Purpose-Driven Life," will conduct a "forum" with Senators John McCain and Barack Obama. Each candidate will be interviewed separately by Warren for one hour. The interviews will focus on four areas: the role of the presidency in government, leadership, the candidates' world view and America's role internationally. The church forum also gives him a perfect setting to counter the misperception that he is Muslim. A recent poll by the Pew Research Center for the People and the Press found that 12 percent of respondents believe the Illinois senator is Muslim. I've been saying for weeks that Obama needs to confront his Muslim problem head on. Maybe Obama will do so tonight. The forum will take place in Warren's Saddleback Church, located in Southern California. The so-called mega-church is the fourth-largest church in America. The two-hour forum will be held in a non-debate format. Warren will have a separate long-form conversation with each candidate for 50 minutes. There will be commercial breaks every ten minutes. The questions to both candidates will be identical to provide a fair comparison, although the follow-up questions may differ, based on their response. Obama will be interviewed first, as determined by the flip of a coin. McCain will not hear the questions during the first hour. Between the two interviews, the candidates will appear together on stage for photographs. "Mr. Asbahi has informed the campaign that he no longer wishes to serve in his volunteer position, and we are in the process of searching for a new national Arab American and Muslim American outreach coordinator," spokesman Ben LaBolt said in a statement. A corporate lawyer at the firm of Schiff Hardin LLP, Mr. Asbahi tendered his resignation after he and the Obama campaign received emailed inquiries about his background from The Wall Street Journal. He did not respond to the email or a message left at his law office; the campaign released a letter in which Mr. Asbahi said he did not want to be a distraction. Mr. Asbahi was appointed the national coordinator for Muslim American affairs by the Obama campaign on July 26. He barely lasted a month. As I said when Obama created the Muslim coordinator position, hiring a "Muslim liaison" isn't enough. Obama still needs to confront his Muslim issue head on.